A Foodie Bibliophile in Wanderlust: Cleveland Rocks! So I finally bit the bullet this summer and started writing a novel. I have no idea where this is going to take me, or whether I'll even finish, but I like the idea that I finally have a story living inside my head that is ready to be written down. In one particular scene that I have envisioned, the main character visits the Rock and Roll Hall of Fame. Since I live less than three hours from Cleveland, I decided that in order for my story to be authentic, a day trip to Cleveland was in order. So last Saturday that's what I did. My husband and I jumped in the car and drove to Cleveland. As we walked through the museum, part of me wondered what took us so long to visit this place. My husband and I are both big music-lovers, and with it being so close to where we live, there really was no excuse. We need to give ourselves permission to take day trips more often. We did it all the time when we lived in Germany. Why did we stop doing it when we moved back home? The sense of urgency to see and do everything before we leave was no longer compelling us to see and do new things. What struck me most about visiting the Rock and Roll Hall of Fame was how much it brought back some of the pride I had lost at being an American. In today's climate of 24 hour news networks always feeding us a heavy dose political propaganda and where Americans are starting to get the sense that we are the most hated nation on earth, it's easy to become disillusioned with our country and want to be one of those people who puts a Canadian flag on the back of their backpack while visiting another country just so people will treat you more kindly. 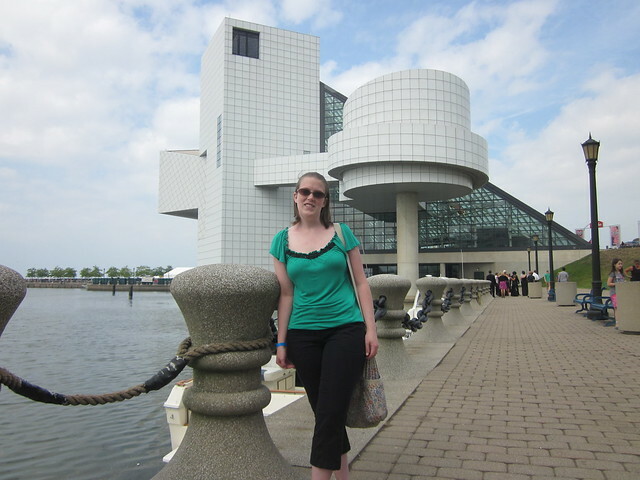 But visiting the Rock and Roll Hall of Fame did something to me. It reminded me of the fact that despite all our flaws, and there are many, we are a nation capable of great things. We created the greatest, most influential music on earth. I loved seeing all of the memorabilia that is part of rock and roll history. I was especially struck by things like the ratty old family couch Jimi Hendrix used to practice his guitar on, all of the song lyrics by so many artists that were written on scraggly sheets of notebook paper (what a great lesson for teachers about the importance of rough drafts! ), John Lennon's upright Yamaha piano that had candlewax spilled on it. I also loved seeing all the glamorous show outfits for artists like Diana Ross, Michael Jackson, and the Rolling Stones. The problem with visiting the Rock and Roll Hall of Fame? The intense desire to rack up a huge iTunes bill with all the music you realize you love but don't already have on your iPod. Like, how could I go this long without having any Rolling Stones or Jimi Hendrix anywhere on my iTunes account? Or Al Green, Ottis Redding, Run DMC? I must remedy this and soon! 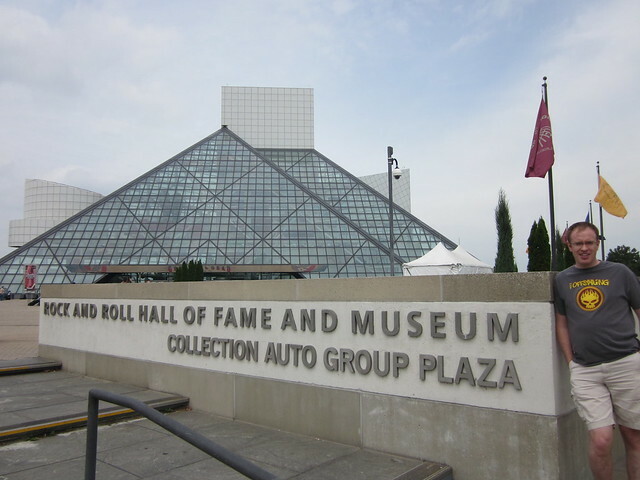 Have you visited the Rock and Roll Hall of Fame? If so, what are your thoughts? Sounds like you're inspired! Did you read Five Flavors of Dumb by Antony John? It's very much about rock and roll history, in addition to being a great YA book!